What I’ve Learned About Whole Book Writing – One, Two! One, Two! Nearly everyone in the profession says to first get your story written – the rough draft bit. Only from that point can you see: 1) character development; 2) plot twists; and most importantly, 3) the big picture. Here, you might be like me, and after seeing all the holes and inconsistencies, you drop your head to the desk and never want to write another word, because calling what you spent months writing a rough draft is simply being polite. But you pick yourself up to see what can be done. After the rough draft is completed, you start hacking away at it, cutting scenes and even chapters which don’t push the story or character development forward. I’ve even thrown away major characters because they were redundant or didn’t serve much purpose. Then comes revisions, lots of them. Then comes letting your critique group read some. Although sometimes my dear critique group reads subs which I later eliminate, but that is because they only see slices at a time (1-3 chapters) v.s. the big picture (whole novel). They do, however, keep me writing and writing and writing, as well as continue being terrific friends. Then come the editor’s comments to address. My next book, Escape: The War Unicorn Chronicles, Book 2, is scheduled for a September 2018 publication date. A month ago, I switched plans and decided to combine two books. Whatever was I thinking? Plus, I feel writing in two points of view is distracting, both for the writer and the reader, yet here I am, doing just that. So…1) finish your rough draft; 2) delete and add; 3) rewrite; 4) revise; 5) send through critique group; 6) revise; 7) send to editor; 8) revise; 9) do word-by-word check; 10) release your baby to the publisher. I hurt my knee. I’ve been using a walker and a cane for a week now, even though I injured it a couple weeks before I started using those aids. Using them makes me look and feel very old. This week I go in for an MRI and then back to the doc to see how to go about repairing it. If I were a sports player, I would have had the MRI done the day it was injured. But I’m a writer…and therefore used to waiting — waiting on agent-editor responses, waiting on edits for revisions or rewrites, waiting for publication date, waiting to hear from booksellers, etc. How, you ask, could injuring my knee have to do with writing? It does. Three weeks ago, I got news one of my books (War Unicorn) was accepted for publication, and I was sent a contract. My husband was not at home so I couldn’t shout and jump around with him— and thereby limit my jumping near my introverted mate. Instead, I did a wild and woolly happy dance all over the house — for a long time. Owie. So my advice, author to author, is that when 1) you get a contract, call someone to scream the good news, or go out and celebrate with an ice cream cone or glass of wine v.s. jumping around like a wild woman; and 2) take good care of yourself by eating well, exercising, spending time both alone and with friends; and 3) writing exercise — injure your character, feel the pain…and write about it. There’s the most obvious two troubles of not having an agent: 1) someone to offer revision suggestions to make your story stronger; and 2) someone to negotiate contracts for traditional publication, etc. But the biggest one to me (as least I think it would be, not quite knowing for sure since I don’t have an agent), is the time and focus bit. An agent often gives revision suggestions, then expect you to have it cleaned up and back to her in a timely fashion. The getting it back to her is the time factor. The focus part is not wandering off, thinking about or actually working on writing other stories. Once I was given a week to complete editorial revisions, this deadline was emailed to me the night before we left for a week’s vacation. And, yes, I did revised it. A couple days ago I spent several hours looking over some of my NaNoWriMo blabber file. I deleted many words, but got tired of the mess on my screen. I finally stopped and sat down with pen and paper to organize the plot, in three acts, with rising and falling tensions nicely placed. I hate this part of “writing.” I’d much rather just blabber away in raw writing on a rough draft. Blah, blah, blah. But after seeing the clutter I’ve write as rough drafts, I find myself wanting to start from the first word and rewrite the entire story. Perhaps I shall. But with no agent pressing me onward to complete revisions by a certain time, I’ve decided to stop, take a Christmas and family break until January, and then dive back in – with a plan! That is, as long as I don’t have the story of the next book waving flags through my brain cells demanding attention. BTW, I already have a pile of notes on that story, too. Oh, agent! Where are you, I need someone to give me time constraints and focus. They say (“they” being conference speakers and authors of books on craft) that first you must get your story written before you go back to rewrite, revise, send through your critique group, revise more, and make the big picture make sense. I thought after nearly a year of writing that I was done with my WIP story, and could look back on the big picture. Actually, I am far from it. What I thought I was finished with was the one character’s POV of the story. And then this past week I saw the big picture and realized that I had it snowing (in my story) from mid-September to the end of December. All I can give for an excuse is that while I wrote the bulk of the story last year that it must have been a long, cold winter. I mean, whatever happened to autumn? I love the fall. It’s my favorite time of the year. And here I went and wrote a story going from summer directly into winter, totally skipping an entire season. And, yes, it was a long, cold winter last year. Still…no excuses. The past couple of days I’ve been getting rid of winter (until the more appropriate later in the story). But another, perhaps more serious, trouble I have is that when I look back on whatever I’ve written, I have the irresistible urge to do revisions, not just seasonally related. It’s like I can make every single sentence in my 60K story better. When I taught second graders one year and used the cute term “sloppy copy” for the rough first drafts of their stories, some of my best writers scribbled, scratched out, and wrote in both big and little letters even in the same word. I was confused until I realized they had taken me quite literally and had tried to make it sloppy. I am not joking that my file with this WIP on it reminds me of my second graders’ sloppy copies. A couple weeks ago, I felt so good to be “done” with at least one character’s POV. I now know I am a long, long way from done. Oh, what a yucky sloppy copy. But at least I know the story, where it’s going, how it ends. Now to take care of ONE of the big picture revisions. Keep on writing (and revising and learning). Burnt Nuts for Breakfast — Revisions or Rewrite? After making Chex Mix (R) every year since cereal was invented, today I burnt my first batch. Last night I’d left the ingredients out so I could make it first thing in the morning while I did an extended morning workout between the scheduled stir times. Only, before the hour time of baking was up, I noticed that distinct burnt smell filling my kitchen. The only thing I can think of was that because it was early morning, and I didn’t want to turn on the bright overhead lights but used a small side light, this may have meant I pressed in the wrong oven temperature. I also may not have stirred as often as in past times because, well, I was multitasking, after all. So here was my burnt batch of Christmas treats–with a full extra can of cashews added to the mix! On went the overhead light to see how much, if any, I could salvage. I put a plate on one side for the burnt pieces and a bowl on the other for the non-burnt pieces. I picked out the obvious ones, and dusted the burnt crumbs off of some bits. I taste-tested many of the sad-looking, dried-out nuts to see if others with those same hues and shrivels should go to the good pile or bad. I’d made a double batch, and it was taking me forever to pick out each individual piece. Plus, my stomach wasn’t feeling too hot from eating all those burnt nuts for breakfast. All this got me thinking about writing (of course). Or in this case, revisions v.s. rewriting. With any novel I finish and set aside for a time, I always find things which need some serious work. There are pieces which can be fixed with revisions. With other novels I feel need for a total rewrite. And still others were obviously merely for keyboard typing practice. You, the author of your finished work, are in charge of your words. Should you go over your novel and hand-pick word-by-word, line-by-line to make it good? Or should you toss the entire batch, I mean, manuscript, and start from scratch with a rewrite? Whichever way you choose, choose, but please don’t serve burnt nuts. (I also don’t recommend eating them.) After all, what is your end goal? Isn’t it to provide good taste for your readers (or relatives’ tummies)? Never, ever be satisfied with burnt. Steroids gives me a perk. This past fall I started digging through some boxes buried in an unused room. One box had notes and papers from writers conferences I’d attended, some nearly twenty years old. I loved attending each and every one. The faces of dear old writer friends popped into my head. The laughter from those times rang faintly in my ear. There was the excellent food and simply a break from the day-to-day life reality. I loved those times and those people–many of whom I am still in contact with. I was glad for the remembering, but I didn’t need a box of outdated files. That large box of past conferences narrowed down to one small file on writing craft gleaned from all those conferences. The rest of those loved ones, which I’d clung to for decades, I threw away. I do the same with my writing, but never while on steroids! I appreciate the umph the medicine gives me to do things I know I should but don’t necessarily want to do. But when I revise or even rewrite, deciding if an entire chapter or even a character must be thrown away is not a decision I trust while on meds. Even though I accomplished most of my 2014 writing goals, they were rather chatty. Thing is, even when writing a simple thing like a list of goals, I find myself stockpiling and hording words. Who am I to think that my words are that important that anyone wants to read so many of them, even me? So for 2015, I decided to throw away extra words. Even though it’s not 2015 yet, I’ll stop here. This morning I stared of out my work window at leaves sparkling in the sunshine in a light breeze. Then reality struck as I realized these are last fall’s brown oak leaves, clutching onto branches overhanging snow mounds, not-not-not giving way until the new leaves force them off next month. It made me think of my present WIP. The story has been done for months. Then, as it sat while I was involved in other projects, I began to see ways to improve WIP Story, even wanting to delete it all and begin from page one on a blank screen. 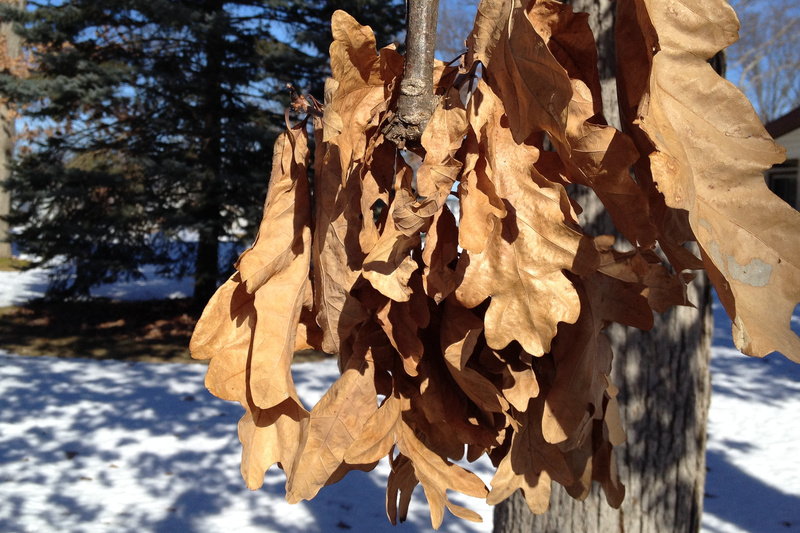 This morning, it struck me that the old dried brown oak leaf represented my WIP Story. Then I went out and took a picture of the shivering old things. Realizing no one could see the shivering in a still photo (although I’ve inserted the shot), I took a video and panned up the tree. In my mindset, I was horrified to see ALL my WIPs fluttering before me. At least hundreds of my old ideas. Thousands. Oh, spring, come quickly! I welcome fresh green ideas and stories.